Not all bondsman and bail bond companies are created equal. Here at AAA Bail Bonds, we pride ourselves on offering efficient, reliable bond services. We offer our services throughout the entire state of Utah. AAA Bail Bonds is a locally owned company that has been in operation since 1962. We offer extremely convenient services and come to see you at most detention centers and jails around the state. AAA Bail Bonds is the only Gephardt Approved bail bond company in Utah. We offer services 24 hours a day, 7 days a week. Additionally, we don’t run credit checks that may damage your credit. We strive to make your bail bond process as convenient as possible. Why add stress to an already unpleasant experience? Obtain your bail bond from AAA Bail Bonds today. AAA Bail Bonds is the only Gephardt Approved bondsman in Utah and we are proud to stand by you. We offer fair, honest and confidential bail bond agreements with NO gimmicks, no interest and no penalties, or extra hidden fees. We do not want to add to an already unpleasant experience for you or your loved one. All bondsman are not created equal, our contract bail bond agents know the system and will answer of your questions 24 hours a day, 7 days a week to get your loved ones out of jail fast! Contact us today and we will come to you! Our contract bail bond agents are all over the state. Find one by clicking the county map below. Get Your Fastest Out Possible! Assault bail bonds have many of the same limitations as other bail bonds, though they do require a personal protection order before the individual is released from jail. This usually involves a no contact order, barring the individual from contacting the victim. Learn more about our assault bail bond services here. Domestic violence bail bonds usually involve a restraining order. This may prohibit the individual from returning to their house before their final hearing. Learn more about our domestic violence bail bond services here. DUIs can cause many problems with your life. It is important to handle these issues carefully to prevent them causing further damage. Check out our DUI bail bonds page to learn more about our services. There is a broad spectrum of possession cases, which results in a broad spectrum of potential bail bond specifications. Find out more about possession bail bond services by visiting our page. Violating a court order can result in significant charges. Learn more about your options for violating court order bail bonds here. After bail has been set by the judge, a bail bond can be obtained. We are then able to post the bail to help you receive a quick release from jail. To learn more about the bail bond process, visit our page here. Bail enforcement processes must be done when a bail bond agreement is violated. To learn more about our bail enforcement procedures, check out our page here. Our contract bail bond agents are all over the state. We service the state of Utah providing bail bonds for Salt Lake County, Utah County, Washington and Iron County, Weber and Davis County, and Cache County. 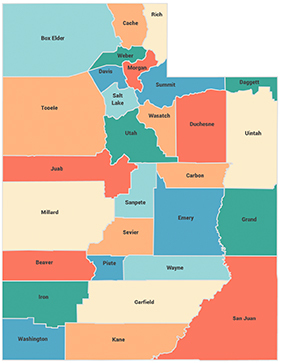 We have access to nearly all county jails in Utah. AAA Bail Bonds were extremely helpful from the first point of contact. They said they would check on my loved one and do everything she could to help. The gentlemen kept me updated. He told me what to expect and was very honest from the start. When it came time for bail, the bondsman was kind and very helpful. It took a matter of minutes for them to take care of their part. They were very courteous and very efficient. I would highly recommend AAA Bail Bonds if you ever need their services. Everyone I had to deal with at AAA Bail Bonds is extremely professional and very nice. They went above and beyond to make the process easy and kept me informed about what was going on step by step. Highly recommend! !